The new fitness center (pictured at left) at the Paynesville Area High School is expected to be ready for use by mid-May. The rubber floor will be delivered in March, and the equipment is expected to be here by mid-April. "If you look at what we have, it will be quit a difference," said Matt Dickhausen, activities and community education director. Dickhausen has ordered $66,000 worth of new and used equipment for the center. "It is all excellent, state-of-the-art equipment," he said. Instead of purchasing all new equipment, Dickhausen said he saved the school more than $20,0000 by securing good quality used equipment. More than 3,500 pounds of free weights were donated to the school, saving another $2,000. The current weight room has only six pieces. Only five people can use the current weight room at a time. It has about 600 square feet and does not meet state fire codes. Dickhausen ordered more than 70 pieces of equipment in February for the new fitness center. It will have weight lifting equipment and cardiovascular equipment. "There will be something there for everyone," he said. Weight equipment includes flex stations, preacher curl, tricep curl, an ab crunch machine, squat press, power bars, and military press. Fitness equipment will include step mills, treadmills, stair climbers, and recreation bikes. 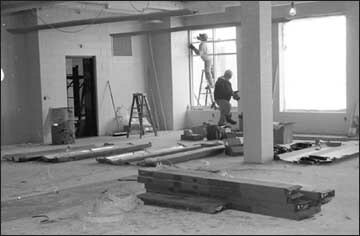 The new fitness center measures about 3,000 square feet and will be able to accommodate a lot of people. "Seven people will be able to work out in the dumbbell area at once. On one flex station, nine people will be able to utilize the machine at one time," Dickhausen said. Dickhausen plans to put cardiovascular equipment in a small room originally designed as an office. Once the center is completed, Dickhausen plans to hold an open house in May for area residents to try the equipment. The center will be used by athletes for training and by physical education classes for weight lifting and fitness training. The school also built the fitness center with public use in mind. Proposed hours for the new center will vary with the time of year, according to Dickhausen. From September to May the center will be open Mondays through Fridays from 5:30 a.m. to 8 a.m., 11:30 a.m. to 1 p.m., 3 to 9 p.m. On Saturdays the hours will be from 9 a.m. to 3 p.m.
From June to August, the center will be open Mondays through Fridays, 6 a.m. to 9 a.m., and 4 to 8 p.m. On Saturdays, the center will be open 10 a.m. to 2 p.m. Holiday hours will vary. Dickhausen said the hours can be expanded if usage warrants it. "We want the hours to be condusive to everybody," said Dickhausen. Dickhausen has also proposed usage fees. Neither the fees nor the hours have been approved by the school board yet. 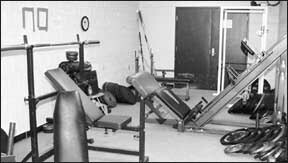 The old fitness room, pictured at right. Family: $190 annually, $125 biannually, or $25 monthly. Single: $115 annually, $80 biannually, or $18 monthly. High school: $70 annually, $50 biannually, and $10 monthly. Single: $165 annually, $130 biannually, or $25 monthly. High school: $110 annually, $90 biannually, and $18 monthly. Students must be at least 14 years old to utilize the fitness center. According to Dickhausen, a family of five will pay about $3.17 per person per month. For an individual, the charge is less than $10 per month. Dickhausen said members will receive a number and their picture will be put in a computer. When people come to the center, they will give their membership number. A supervisor will check the computer to match the face with the image to ensure the center isn't used falsely. Students using the center with a class or a team will not need to be a member. But if they use the center individually, they will be required to have a membership or pay a daily fee. "The rates are to ensure we can hire a qualified supervisor for the center," Dickhausen said. "The rates are lower for district residents because the community paid for the center through their taxes. Now we want it to be monitored and kept safe." Community education plans on offering weight training classes for men and women once the center opens. Dickhausen will also be providing personal fitness training as he has obtained his personal training certification. If anybody has suggestions, they can contact Dickhausen at community education by calling 320-243-7570.